If you were thinking that this year you’re going to skip buying a pumpkin, I warn you now, stop reading this article because I’m about to give you 15 reasons why you should go out and purchase a pumpkin… RIGHT NOW! But in all seriousness, getting through fall without even one pumpkin is no fun, so if you are at a loss as to what to do with your next pumpkin… read on! Pumpkins are one of the most beautiful and practical vessels. To impress you with a little trivia, did you know that a pumpkin is not a vegetable but in fact a fruit? And to shock some of you even more, it’s actually a berry! Pumpkins belong to the family Cucurbitaceae, which includes cucumbers, melons, squash, and gourds. But enough with the trivia, here are some fun things you can put in your pumpkin to impress your friends and family. The below ideas work for both real and faux pumpkins. 1. Make a pumpkin centerpiece. Purchase ready-made “fall” bouquets at your local grocery store and arrange them in your pumpkin. You can either just put a vase in your pumpkin which is slightly smaller than your pumpkin. 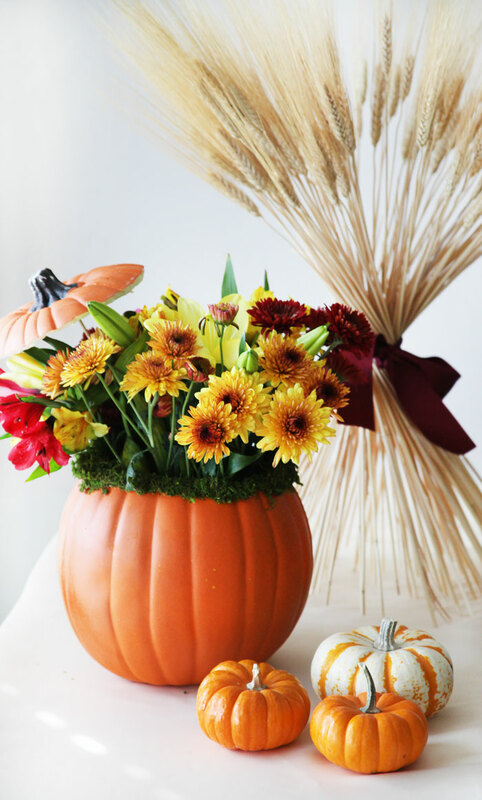 Or, you can fill your pumpkin with green oasis foam and arrange the florals however you like… you can’t go wrong! 2. Use a pumpkin as a drink cooler. Fill your pumpkin with ice and arrange wine, beer, or any drinks inside it. A large cooler pumpkin makes a beautiful presentation. 3. Use pumpkins as pedestals. Adorn your buffet with various sized pumpkins and use them as pedestals to give your buffet a sense of height and dimension. 4. Does your food need to be chilled? Use your pumpkin as a ready-made cooler! If you are serving shrimp or other foods that need to be “on ice”, simply fill your pumpkin with ice and place a bowl on top. Much like a drink cooler, this technique is a great way for food presentation as well. 6. Fill your pumpkins with delicious dips. The smaller pumpkins are perfect vessels for your favorite dips! 7. Pumpkins are perfect vessels for snacks as well. Just empty out your pumpkin, cover the inside with wax paper, place a pretty bandana or dish towel on top and fill it with your favorite nacho chips, potato chips, or practically any snack. 8. Arrange your veggie selection in your pumpkin. Forget the platter, use your pumpkin to hold all your fresh veggies. 9. Use your pumpkins to hold your candles. 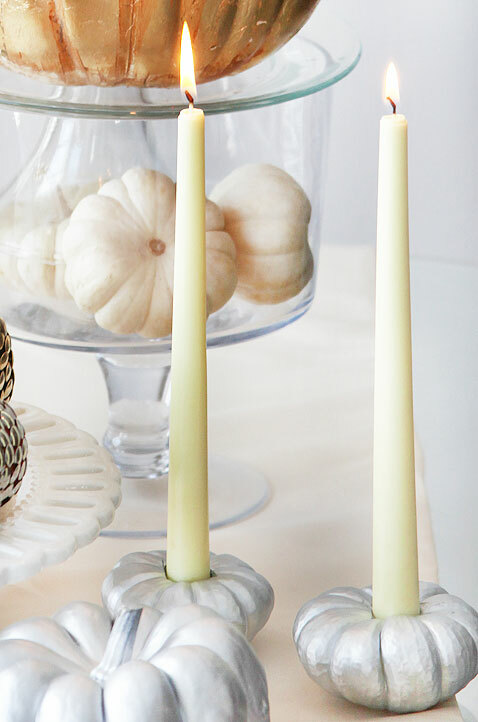 Whether tapers or tea lights, pumpkins are great vessels for your candles. 10. Fill your pumpkins with olives, cocktail onions, and other garnishes at your bar area. 11. Fill your pumpkins with breads, breadsticks, and muffins. Just line it with wax paper, cover the paper with a bread cloth or bandana, and serve the bread items on top. 12. Create a candy pumpkin bowl. Pumpkins make great vessels at your dessert table. Just cut an opening in your pumpkin to fit the glass bowl you would normally use and place the glass bowl inside the pumpkin. Then, just fill the bowl with hard candy, like candy corn, and you’ll have a beautiful candy presentation. 13. Use your pumpkin as a planter. Looking for great favors to give to your guests? Purchase small pumpkins a few weeks before your party, empty them out, put planting soil inside and plant something inside. Great for herbs and other fast growing plants. Makes a unique container for plant favors. 14. Fill your pumpkin with condiments and salad dressings. 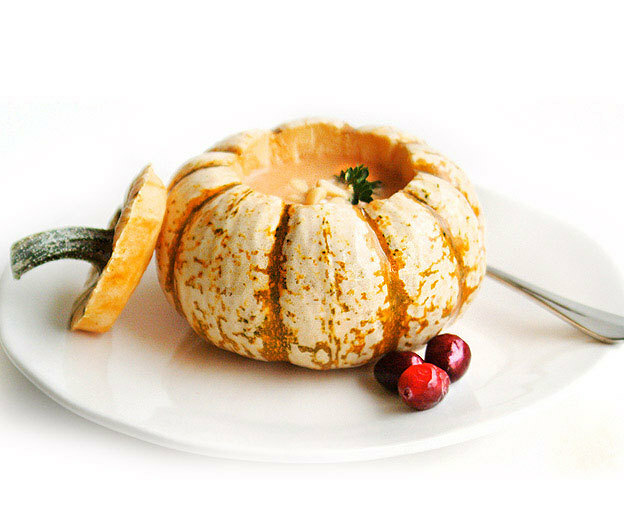 Sauces such as ketchup, mustard, or any salad dressings look great served in a pumpkin. Just provide a sauce spoon for your guests to serve themselves. 15. Serve pumpkin punch or other pumpkin drinks directly from a fresh pumpkin. It just doesn’t get any better than that!